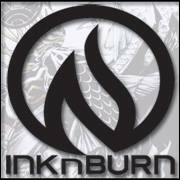 I am super pleased and proud to announce that I was chosen to be an ambassador in 2014 for the company INKnBURN! INKnBURN is based in Orange County, California, and designs and manufactures all of their vivid and unique fitness products there, which means no outsourcing! All of their styles are created with endurance runners in mind, but everything crosses over easily to other activities and endeavors, and even work and play. Their focus, goals, and processes are outlined here. As a small company, they are about much more than just high profit margins and a bottom line. They are involved in the fitness community, and are truly interested in providing amazing clothing for training and racing that help athletes achieve their goals in comfort and style. I’m really looking forward to bringing INKnBURN along this year on all of my Alaskan adventures! To try out any of their goodies for 15% off, use code INBSK14 at checkout! Under normal circumstances, I can confidently refer to myself as “A Runner”. 5 miles? Piece of cake. 10 miles? Sounds like fun. 15 miles? Let me check my schedule, but I can probably fit it in. These days, I’m not facing ‘normal circumstances’. On Monday, I ran 0.1 miles. And that was my highest mileage day in months. And what caused my little jaunt on the treadmill to end abruptly at one-tenth of a mile? Oh, just the feeling that my pelvic floor was going to fall out. Yuck. Recovery from baby #2 is definitely following a different timeline than baby #1. 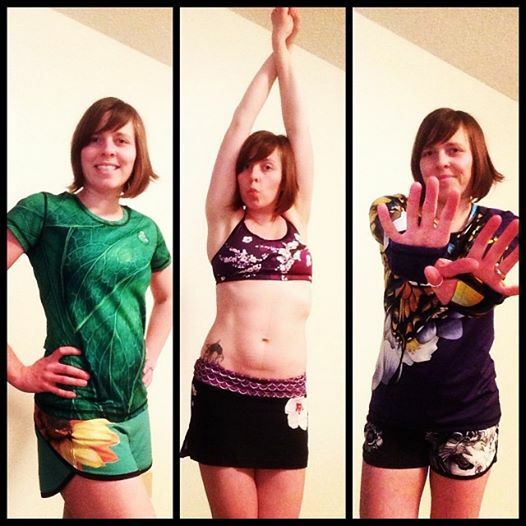 The first time, I started running with the jogger at three weeks postpartum. This time, at a month in, I’m barely able to plod along for 60 seconds, pushing nothing. Luckily, I was in super-good shape when I got pregnant last winter, or who knows the state I’d be in now. The last race I ran was as a leg in the Redding Marathon relay in January. I thought I could squeeze in a couple more races even after I was pregnant, but that became not so much of a priority after the fact, and my 2013 race calendar was cleared. 2012 had been a pretty good running year for me. I ran my first road marathon at the Carlsbad Marathon, had two solid 15k trail races (even won third in my age group! ), and got a 50k PR at the Siskiyou Outback. I will never be this tan again. Thanks, Alaska. 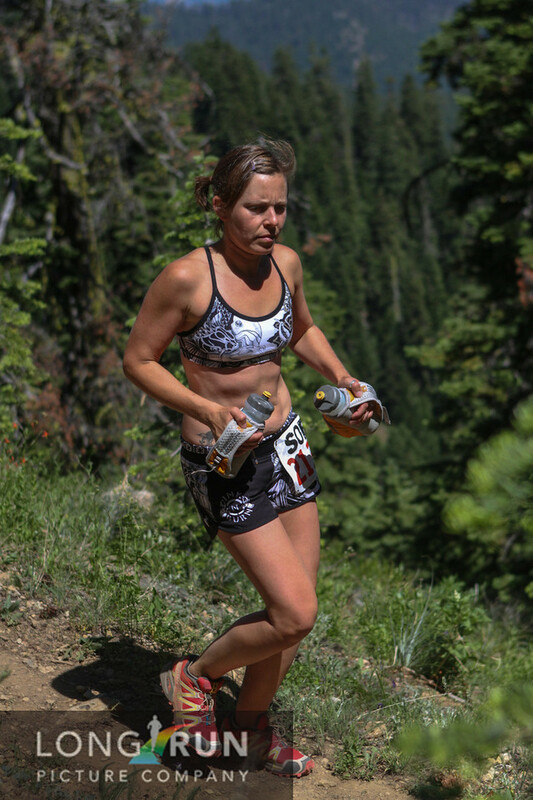 Siskiyou Outback 50k, July 2012. Feeling ambitious, I filled out a 2014 race calendar online. I added in every Alaskan race I was even remotely interested in. Then I actually looked at it. And smacked myself. My motivation was rooted in both in antsiness from taking the year off, and the novelty of the new and amazing selection of races available, but it was just stupid. I was looking at a half marathon on a Sunday, and a 24 mile trail race the following Saturday. Without seriously abbreviating my plans, I was sure to be a sad, quivering pile of injured mess by next fall. Willow Winter Solstice 5k, Willow, December 21, 2013. This is extremely tentative depending on if I feel ready. If anything, it will probably be more of a 3 mile hike in snowshoes. No Canoe Loop 11-miler, Willow, March 8, 2014. In the summer, this loop covers a long stretch of lakes. Paddle across one lake, hike your boat to the next, repeat. In winter, no floating is required. Kal’s Knoya Ridge Run, 8.5k, Anchorage, May 22, 2014. Part of the Alaska Mountain Runners burly series. Red Shirt Lake Trail Run, 6 mi, Willow, May 31, 2014. A nice looking trail race for after the snow season. It looked like a fun reintroduction to running on actual dirt (read: muddy as hell!). Robert Spurr Memorial Hill Climb, 3 mi, Bird Ridge, June 15, 2014. Another in the Alaska Mountain Runners series. Mount Marathon, 3 mi, Seward, July 4, 2014. This one’s kind of a big deal. It even has a Wikipedia page. It was created on a bar bet that no one could run up and down Mount Marathon in under an hour. The lottery opens January 1. The drawing system is weighted by the number of times you’ve tried to get in. Being my first time, I’m not counting on this one, but I’ve been known to be lucky. Crow Pass Crossing, 24 mi, Girdwood, July 26, 2014. This is my ‘A’ race of the year. Traveling from Girdwood to Eagle River by car is a 50 mile drive, because the highway circles all the way around the Chugach mountains. This is only a 24 mile run from Girdwood to Eagle River because is shoots straight over the mountains. The first 4 climb, and the last 20 descend. Downhill running is not my strength, so I have my work cut out for me. Alyeska Classic Mountain Run, 2.5 mi, Girdwood, August 16, 2014. The final race in the Alaska Mountain Runners series. May be passed up if my almost-kindergartener is ready to run a 2k in Anchorage the same day. He’s already expressed interest, and his running interests will certainly trump mine. Lost Lake Run, 16 miles, Seward, August 23, 2014. I’ve been advised that this run is amazingly beautiful. Kesugi Ridge Traverse Trail Run, 28 mi, Denali State Park, September 6, 2014. 6-9 hours of running with Denali as a backdrop? Count me in. Photos I’ve seen from this point-to-point trail are breathtaking. Hopefully the weather will be such that views are available, but September can be quite squirrely and unpredictable. This will be my toughest race ever. Please be aware: This is not a course for beginning trail runners. There are significant climbs and difficult terrain. If you have never traveled the course before, we strongly encourage you to do so. The trail will not be marked, so familiarity with it will be very important. Please do not over-estimate your abilities! The most common, recurring theme regarding weather descriptions reads “lousy weather, cold winds and poor visibility are common”. If you have never run a marathon or race of this distance, please reconsider signing up. If you have only run road marathons, but never tackled trail running, please reconsider signing up. Running the Crow Pass Crossing or Resurrection Pass 50 would be good personal pre-requisites. There will be no aid stations. There will be a race official at Ermine Hill and a trail sweep, but no refreshments out on the course. You will be responsible for your own food and water. Drink water along the course at your own risk. There are plenty of available streams. There is no mandatory gear BUT a few things are recommended: long sleeve tech shirt, wind jacket with hood, wind pants, stocking hat and enough water and food for 28ish miles, plus a trail map. If you choose to drink water along the course, a filter bottle is recommended. Reflective gear and a headlamp may help depending on weather and in case you get lost. So my goals are in place. I’m not going for any speed records this year, just finishes. Crushing old times will be business for 2015. The only problem now is that there is a significant gap between running 28(ish) unsupported, rugged trail miles in possible inclement weather and plodding 0.1 miles on a treadmill. Fortunately, I have over 7 months until Crow Pass and almost 9 to get ready for Kesugi Ridge, and I’m already making progress. For the past two weeks, I’ve been hitting up the gym Mondays, Wednesdays, and Fridays. To start out, I walk on the treadmill for a mile, with intermittent attempts to slowly pick up the pace to something that resembles running. Not an exciting way to start my workout, but it’s already getting easier to accomplish the task. After warming up, I throw in some weights. The first day back, I did some barbell dead lifts, dumbbell overhead presses, and lat pulldowns, with my little audience of Skye napping in his carseat nearby. The second day I started with barbell squats, but was interrupted by gym management. I was fully expecting the confrontation sooner or later, but hoped I would skate by without a liability lecture. Despite Skye being tucked in a corner far away from any [reckless and blind?!] weightlifters, other than myself, the possibility was too great that someone would walk by and drop a weight on him, so we were banished to the machine weight area. The past few days, I’ve been limited to machine leg curls, extensions, and presses, and the variety of push/pull upper body choices. I like, and benefit from, free weights much more, but machines will have do for now. I’m making the most of it. To finish up my workout, I do some 100m and 500m rowing intervals. The whole workout is interspersed with breaks to tend to baby needs, so the process usually takes about 1 hr. 45 min. That works fine for Silas, who is never ready to leave the play area when I come to pick him up. 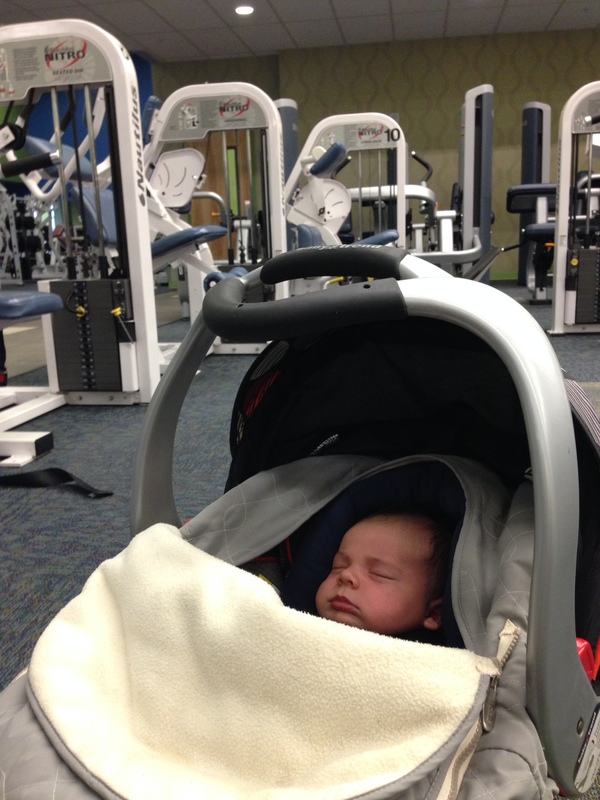 The whole gym situation is a win-win for all three of us: workout time, nap time, and play time. In the months to come, I’ll be adding in skate skiing (a trail quite literally goes through our backyard), trail running (as conditions permit: we’re mere miles from trailheads in the Chugach State Park), and track workouts (an all-weather track is about a mile from the house). My current gym workouts are a far cry from where I hope to be in the near future, but they’re wildly effective. I’m back in most of my old clothes, my waist has shrunk an inch in the last week, and on Wednesday, I finally ran 0.25 miles. Only 27.75(ish) to go.